The province of Perugia (Italian: provincia di Perugia) is a province in the Umbria region of Central Italy. Its capital is the city of Perugia. The city of Perugia is also the capital of Umbria. The province of Perugia was created in 1860 as Province of the Umbria. At that time, the province was larger than now because the present Province of Terni was included. In 1927, the old province of the Umbria was divided in two provinces, Perugia and Terni. 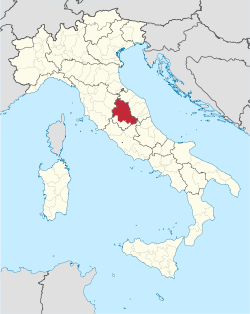 The province of Perugia, with an area of 6,337.15 km2 (2,447 sq mi), is the larger of the two province in Umbria. The province is bordered to the north and east by the Marche (Pesaro and Urbino, Ancona, Macerata and Ascoli Piceno provinces), to the south with Lazio (province of Rieti) and with the province of Terni, and to the west with Tuscany (Siena and Arezzo provinces). The main river in the region is the Tiber. The largest lake of the province, and of Umbria, is the Trasimeno, one of the largest lake of Italy. The highest mountain in the province is Cima del Redentore, in the same group of mountains of the Monte Vettore, with an altitude of 2,448 m (8,031 ft). There are four regional natural parks in the province of Perugia: Parco di Colfiorito, Parco del Lago Trasimeno, Parco del Monte Cucco and Parco del Monte Subasio. The Monti Sibillini National Park (Italian: Parco Nazionale dei Monti Sibillini) is mainly in the Manche region but part of it is in Umbria. As of 31 December 2015[update], there are 662,110 persons living in the province, for a population density of 104.5 inhabitants/km². The largest comune is Gubbio, with 525.78 km2 (203 sq mi) and the smallest is Paciano, with 16.91 km2 (7 sq mi). The comune with fewest inhabitants is Poggiodomo with 117 inhabitants. ↑ 1.0 1.1 1.2 "Provincia di Perugia" (in Italian). Tuttitalia.it. Retrieved 19 July 2016. ↑ 2.0 2.1 2.2 "Statistiche demografiche ISTAT" (in Italian). Demo.istat.it. Retrieved 19 July 2016. ↑ "Italy Province High Points". Peakbagger.com. Retrieved 20 July 2016. ↑ "Comuni in Provincia di Perugia per popolazione" (in Italian). Tuttitalia.it. Retrieved 19 June 2016. ↑ "Comuni in Provincia di Perugia per superficie" (in Italian). Tuttitalia.it. Retrieved 19 June 2016. Wikimedia Commons has media related to Province of Perugia. This page was last changed on 17 November 2017, at 04:07.